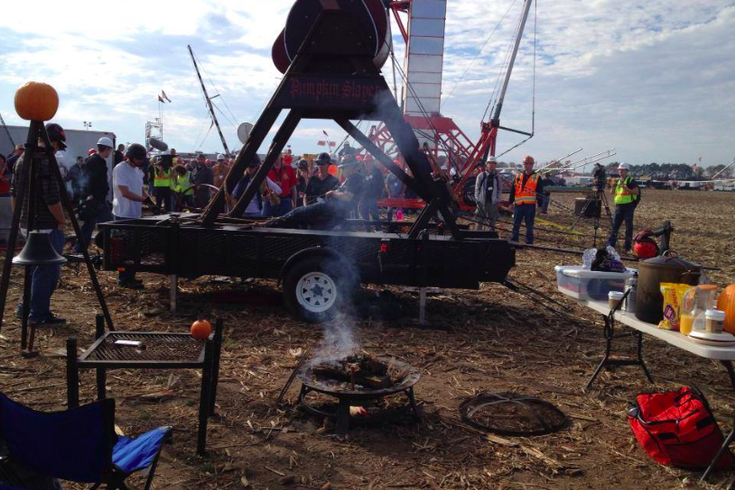 Scene from the World Championship Punkin Chunkin in Nov. 2013. A Delaware woman is fighting for her life after an air cannon exploded Sunday afternoon at the annual Punkin Chunkin event in Bridgeville, state police said. According to authorities, the incident occurred around 2:45 p.m. just as the "Pumpkin Reaper" air cannon was preparing to launch on the final day of the competition at Wheatley Farms. Investigators said the trap door of the cannon, where pumpkins are loaded, separated at the point of the launch for reasons yet to be determined. The door and other parts of the cannon were projected into the air before striking the 39-year-old victim in the head and face. Video of the incident was uploaded to YouTube. The woman, who has not been identified, was immediately treated at the scene by Sussex County Paramedics and later transported by EMS to Nanticoke Memorial Hospital. After the victim was stabilized, she was flown to Christiana Medical Center, where she is listed in critical condition. Master Cpl. Gary Fournier of the Delaware State Police said Monday afternoon that the victim remained in critical condition at Christiana. A 56-year-old man was also injured in the explosion and transported to Nanticoke Memorial Hospital, where he is being treated for non-life-threatening injuries. Delaware State Police detectives are being assisted in the investigation by the Delaware Department of Natural Resources. The World Championship Punkin Chunkin has been held at various sites in Delaware since 1986. It was not held in 2014 and again in 2015, when organizers had difficulty attaining liability insurance. "It is with a heavy heart that we announce the cancellation of the 2015 World Championship Punkin Chunkin event," a post on the Punkin Chunkin Facebook page read at the time. "Unfortunately, despite the best efforts of our board throughout an exhaustive nationwide search, we have been unable to locate a willing insurer to adequately protect our host venue, our organization, our fans and our spectators."